As a battlefield guide, Steve Smith uses his knowledge and skills to good effect to research the men from Worstead and Westwick and the battles in which they lost their lives. It has obviously been a very personal journey and he includes pictures of many of the headstones of the graves of the men that he has visited on his travels. A chronological approach allows Smith to give a broad overview of the First World War and its progress. Each chapter covers one of two men who died in a particular battle or campaign, but rather than simply write about them in isolation, Smith helpfully presents a wider overview of the context in which they died, helping to provide a more rounded piece of work. In particular he focuses on the 1/5th Battalion of the Norfolk Regiment – often referred to as the ‘Sandringham’ battalion – at Gallipoli and discusses some of the myths that surround their fate on 12th August 1915. His account of the opening day of the Somme looks at the part played by the 8th Norfolk Battalion who, as part of the 18th Division, successfully attacked Montauban at the right flank of the British advance. Interestingly a letter from a soldier in the 8th East Surreys is included, believed to be previously unpublished, which makes reference to witnessing Germans chained to their machine guns; this is an occurrence that has been widely dismissed so it is interesting to read a first hand account. The book does not just cover the First World War; Worstead and Westwick’s memorial also honours nine casualties from the Second World War and the stories of these men are dutifully covered too, from the Battle of Singapore and the war in the air to Salerno and the D-Day landings. The book could have benefited from further editorial input, however this is an excellent piece of research that uses comprehensive sources to paint a picture of the local men who lost their lives. 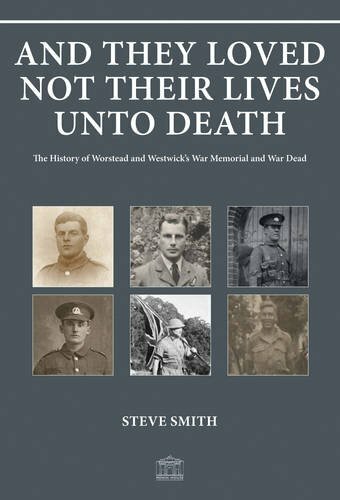 Like many books about war memorials this book will appeal most to people who have a connection to either the area or the men it covers, but Steve Smith does a good job of making it an interesting and well-rounded read that is a fitting tribute to these men.